I received a couple emails in a row asking if Gingko was “still active”, despite putting out what (to me) is quite a lot of updates… I realized that they’re all over the place, but not here on the blog. I’m most definitely still here, working hard and full-time on fixing bugs for current Gingko, and developing the next version (Desktop + web). Most updates for that take place on the community forums. I also started posting videos on YouTube, and will continue to do so, once our schedule returns to normal. For those who aren’t aware: my wife and I both work from home, and homeschool our 4.5 yr old son. He’s normally with us five days a week, and with the grandparents the other two… except for the last couple months when we’ve had him 6 or even 7 days a week. So, that’s my mini update. I’m trying to be more visibly active, and I need to get over perfectionism in order to do so… working on that daily! 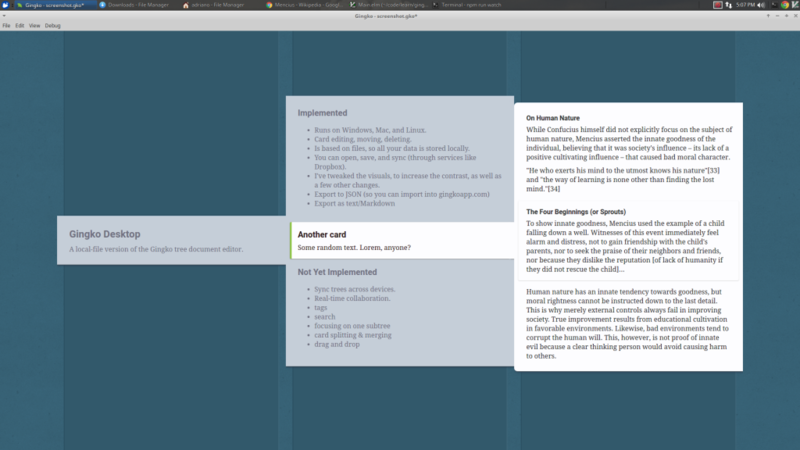 Gingko Desktop is now ready for testing. Is based on files, so all your data is stored locally. You can open, save, and sync (through services like Dropbox). Visual changes, to increase the contrast, as well as other tweaks. I need volunteers willing to test it on various platforms. If you’re willing to try it out, please get in touch with me sign up at the form above. I’ll be making wider announcements as I continue to iterate on this. I’ve decided not to pursue the Kickstarter Open Sourcing at this time. There are a number of reasons, but the most important is that it would mean a very long time before Gingko would start improving again for you, the user. I had been working on the campaign for weeks, and still hadn’t completed the script for the video. After that I would have had to create the visuals to accompany my voiceover, edit it all, write all the campaign copy, write a newsletter. Then, once running, it would have been a month where my entire focus was on pushing the campaign, overriding both my ability to provide support, and the time I’d need to ship improvements. Assuming the campaign succeeded, it would then take significant work to make Gingko open source (I’d have to restructure the code, make it easier for others to install, document it fully, and much more). And in the end, it’s only a hypothesis that open sourcing would lead to a faster improvement cycle eventually… that’s something that depends heavily on random factors. So, on the one hand, even assuming success (not guaranteed), it’s months of work, for very little actual return for you users. I still believe Open Source is a good direction to move towards. And I would like more collaboration. But it’s not time for this yet. Make great software… everything else is a distraction. For the last month, I’ve been working on a collection of features that combine both the most frequent request I’ve ever had (a true, download to your device(s), offline capable Gingko), with other changes that people haven’t asked for ever, but I believe will make Gingko far more powerful than it is now. It’s the greatest coding challenge I’ve ever undertaken, but it’s going well, and I’m making progress every day on it. If you were excited about open source Gingko, I will mention that I am for it in principle. But I’m wary of big and irreversible change, in a direction I’m not experienced in, when it’s not clear that it will be for the better. Instead of open sourcing to everyone, all at once, I will instead be willing to take on “semi-open” collaborators as bandwidth permits. If you are yearning to hack Gingko (for the benefit of everyone and not just your own niche use-case), get in touch with me. If we’re a good fit, I will give you access to the code. These days, I’m coding 100% of my working time (sometimes forgetting to eat lunch, which I don’t recommend). Customer support happens in pockets of time on my evenings and off days. And I’m loving it. I feel both relieved and excited about moving forward. An excitement I haven’t felt in years. When I can, I will post specifics of my progress so far. PS: I added Copy/Paste to Gingko a few weeks ago. You can now hit Ctrl+C to copy a subtree, and Ctrl+V to paste it. It’s a little slow, but it works. Gingko is, and always has been, small, self-funded, and profitable. It continues to grow steadily, via word of mouth alone. Take the path of selling Gingko off, and hope that my successor follows the spirit of the project and doesn’t let it die. Take the path of opening Gingko up completely in one shot, and risk irrevocably damaging the business. Thereby failing in my responsibility to my current users, and the family I help support. Devote all my energies to growth and profit, and stop making improvements until I achieve “scale”. Go big or go home. Each had its attractions, but none are ideal. But, towards the end of the 5 month journey I took with my wife and son, I realized another option: “sell” Gingko to the world. Open-source Gingko, but raise a buffer to support both my current users, and my family in the transition. Bring Gingko, and its vision, to a wider audience. Today, Tuesday Oct 7th, Gingko was been down for a 2 hours. I’ll post back when I do a complete post-mortem, to find out what caused this, and how to prevent it. Rest assured all your data is safe. In fact, early indications are that the cause of this is that I may have been too eager with our backups: both a full database backup and a complete disk image backup were scheduled to run at the same time!